“I’ve had many readings in my life and the Bone Throw was definitely one of the very best ever – from the power, the beauty, the interpretation, the intuition, the tradition, the accuracy – amazing!” -T.C. Personal healing, relationships, health, work, finances, life purpose, clarity for next steps in your path…what guidance are you seeking? 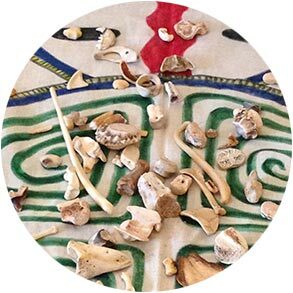 Bone Throwing is an ancient divination ceremony and healing art. In the Ka Ta See lineage, Bone Throws are described as a Calling of the Spirits Ceremony. In response to your questions, this powerful healing ceremony offers guidance, doctoring, and teachings from the seventy spirits in the bone bundle. The doctoring and gifts from the spirits will begin before we meet and continue to touch your life after you receive the ceremony. Contact JoAnne to schedule your personal ceremony. In the ways of Ka Ta See, the apprenticeship as a Bone Thrower involves in-depth experiential learning and cultivation of personal relationships with the spirits. 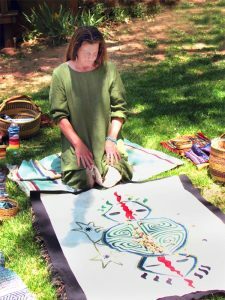 Following several years of extensive studies, JoAnne received permission to share Throwing of the Bones Ceremony as part of her healing arts practice. She has been studying with Kay Cordell Whitaker who apprenticed with Chea Hetaka, a Peruvian elder. Traditionally, the ceremonial art of Bone Throwing is a medicine way passed on among the women in Chea’s tribal culture in the Eastern Andes. Chea described bone throwing as the oldest form of divination on the Earth. “Your Bone Throw far surpassed in depth, clarity, and accuracy the many astrology, intuitive, and numerology readings I’ve had. The Bone Throw answered a number of key questions about my career and where to live, providing me with an inspiring roadmap to take my next steps with a sureness and joy in my heart.” -D.R. “Your communication with the spirits and the way you express the knowledge is profound and very beautiful. I feel I received an indescribable healing.” -J.H. Interested in learning how to Throw the Bones? Throwing of the Bones Ceremony is one of the great passions of my life. In addition to sharing the ceremony with individuals and groups, I offer an apprenticeship to delve into this ancient ceremonial healing art and learn how to throw the bones. To apprentice as a Bone Thrower involves learning much more than a particular technique. You will be learning this ceremony as an integral part of the Ka Ta See lineage, in the cultural context as shared by the Hetakas, and as I have learned through my apprenticeship these many years. Where these explorations can take you in your personal healing and growth, in developing close connection and clear communication with your spirit guides, in your relationships with all others and life itself, is filled with beauty, healing, and magic beyond what words can express. Visit here for more information about the apprenticeship. Feel free to contact JoAnne to discuss your interests in these studies. Videos from Bone Throw Ceremony ~ How Can We Heal? Meet Luna from JoAnne Dodgson on Vimeo. Bone Throwing Ceremony with JoAnne Dodgson from JoAnne Dodgson on Vimeo. “I have participated in two Bone Throw Ceremonies with JoAnne and have another scheduled. I found JoAnne’s powerful spirit and her gentle healing presence of great assistance as she helped to guide me toward greater clarity and sense of my life purpose. She has an amazing ability to create safe space and impart love and honor in these powerful ceremonies. I am eternally grateful.” -S.B. “I feel a dynamic, living force in this tradition that I first noticed in the moment I heard the sound of the bones falling to the ground at the beginning of my reading. That sound triggered something deep inside me: a remembrance of myself that is incredibly familiar and also ancient, that was then reflected in what the bones told us in my ceremony. The bones speak through you powerfully, and you carry this lineage with such grace and beauty. I feel called back to myself, affirmed in my path; shown the places I am traveling and have yet to go. Thank you so much for carrying this powerful way of connecting with source and spirit.” -M.J.
“It was an extraordinary and encouraging conversation for almost 2 hours. She recorded the session and I’ve been able to listen to it since my appointment, to my benefit. I felt very grateful and humbled by the accuracy of the messages coming through this ancient practice, and the loving skill of this Shaman. I highly recommend this experience to anyone who wants to engage in dialogue with spirit. A remarkable experience!” -A.B. “I am still feeling so blessed by you and your insight. The Bone Throw has rocked my world in a very good way. I came home so inspired to speak my truth. It was such a wonderful language to hear. We have some very loving conversations going.” -L.M. “Your connection to the animal nations represented in your bone bundle is so beautiful and the information so pure. There is much to ponder in the days to come as this knowledge awakens new birth in my life.” -L.G. “JoAnne helped our zero-waste local economic development non-profit at a time when we were at an important decision-making point. Her Bone Throw informed us to make our decisions with more assuredness. Her ability to deeply hear what we are about and speak the message of the Bones in a way that made sense to us was remarkable. And her presence and focus offered a calm energy for her delivery.” -M.C. “The Bone Throw I received was and continues to be transformational. It is helping me to shift out of patterns of disempowerment and step more and more fully into my power.” -M.C. “More magical still is her Bone Throw Ceremony. Elk and Owl and Buffalo bones were the gentle reminders of where my path lays and what I am to do. I came away from the experience more grounded and assured.” -C. J. “Much appreciation for this powerful ceremony. You are a gift!” -C.H.